I was excited to send a few questions to the founders of AC Noises based in Italy. Andrea and Claudia are a couple that decided to turn their interest of pedals to a business. Working with your significant other can be extremely rewarding (speaking from my own personal experience). Claudia uses her skill as a fashion photographer to bring great product shots, as well as a creative eye to the designs of the pedals. Andrea brought his knowledge of circuits as well as his skills as a musician to the table. Together they formed AC Noises. I sent them some questions, and they were kind enough to answer them. Please check out their website, like them on Facebook and give them a follow on Instagram! – Where is AC Noises based out of? C: We’re based in a small country called Cabiate, which is very close to the much more bigger and well known Milan. It’s one of that kind of place that allows you to enjoy all the good stuff from the big city without suffering its frenzy and that’s just perfect for us. A: It’s located inside the Como’s county, a very beautiful place close to the Switzerland border. And always speaking about Como, it’s the same city where Alessandro Volta was born and you know, it’s a very exciting thing to make electrical stuff from the same area where the electrical battery was invented. – How long has been AC Noises been creating pedals? A: Like many other builders out there, we spent several years making pedals for ourselves and for our friends. When we decided to create AC noises, we worked hard on our prototypes for a year at least and than we officially showed our first three pedals during December 2016. C: Yes, AC noises is just five months old actually but we spent last couple of years to make everything possible. A: We are totally music and art addicted since we were kids. I’m a music composer/sound designer for web and television since ten years and Claudia is a photographer who mostly works for the fashion industry but she also has a past as an illustrator. When I was building pedals for myself to make my sounds more personal as possible (and that’s a very important point if you work as a sound designer), Claudia was always curious about those small aluminum boxes and she always tried to ask me something like “Why you don’t paint them? Why do you leave them with that sad grey and those boring knobs?”. I was not taking her curiosity so seriously because you know, I knew about boutique stuff of course but I was a simple gear user at the time. A: When she told me that, something happened. I thought “That’s a good idea. I’m able to build cool sounding pedals, she has a very great aesthetics taste. So, why not?”. – What was the first flagship pedal for AC Noises? A: Actually, our top seller is the ESPLORA (fuzz). We’re not so much surprised about that because It was purchased even from bass and keyboard players (I mean original Wurlitzer piano and not just synthesizers), so we can say that it sounds very cool on everything. Anyway, to be honest the other two pedals are well defending themselves. We’re a brand new small company but our first customers seem so excited about the pedals, how they sound and even about the quality of their manufacture. This is the most important thing for us for sure. – What would you say is AC Noises “mission statement”? A: One of our priority is to make effects pedals which can inspire the musician/sound artist constantly, trying to never getting him bored about that specific sound. As a music composer/sound designer, I definitely know how a physical gear (or a plug-in too) can get the artist tired about that saturation, that color or that expression. That’s a very important aspect, actually: if an artist is not inspired, their music will be the first victim and than will be the listeners of course. We have to avoid that. It doesn’t matter if you’re using a basic preamp or a super-weird ring modulator with ten toggle switches and options, you just have to be constantly inspired because you’re doing a very serious thing for this society. You’re creating. 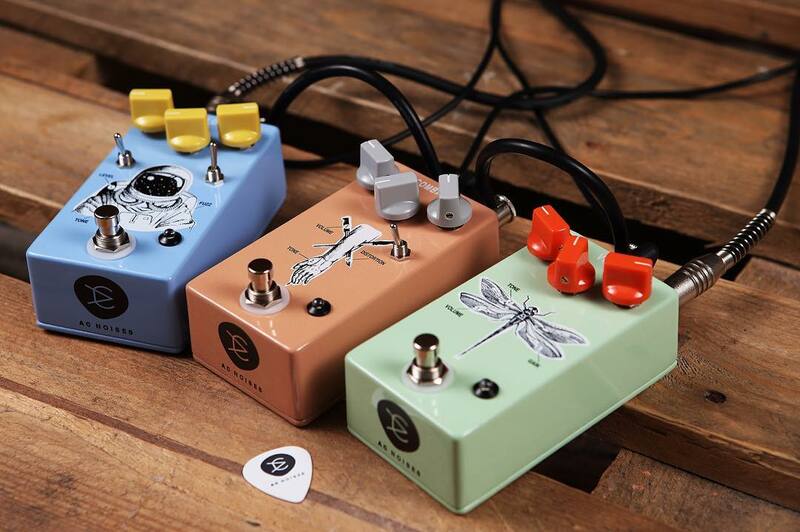 Speaking about that, we’re very proud about our first three pedals of course. In their simplicity they offer a lot of possibilities and shades. People out there are starting to notice that and this is the reason why we’re so happy about these first five months. C: Another priority will be also the aesthetic aspect, we absolutely don’t want to hide that (why should we?). We have to do that because is in our DNA, we need to take care about the look of our products because is one of the most important things that this country taught us through the centuries. Of course we don’t pretend that our pedals look cool to everybody out there (everyone has his personal taste fortunately) but we absolutely want to take care about the design because we need to. That’s it. – I see your primary pedals are a Distortion, Fuzz and PreAmp/Overdrive. What pedals do you have coming next? A: We’re actually working on a couple of circuits. We don’t want to anticipate anything because it will be our pleasure to do that at the right time. Just know that they are NOT gain-related. – Do you have any notable players using your pedals? A: It depends what do you mean for “notable”. If you mean “famous”, a friend of mine sent us a pic of Chris Cornell taking a VOLA (preamp/overdrive) in his hands a couple of weeks ago. We actually don’t know if that pedal took a safe place on his board or not but it was a great pleasure to see that pic. of course. If you mean “very good player”, we’d say everyone and that’s a really cool part of this job: we’re meeting a lot of very good persons and in many case they are very talented too. If I have to give you a name, I’d probably chose Joan Mattsson from Year Of The Goat, a really cool band from Sweden. C: Yeah, Jonas is one of the nicest person we ever met. Anyway, I also like Daniele Fiaschi and Duilio Galioto. They play the guitar and the keyboards for a lot of famous/popular Italian artists like Daniele Silvestri and Diodato. When they tried our pedals I was kind of scared because their “fame” but they were super nice and they made us feel so comfortable. – Do you have any plans (or every) exhibited at NAMM? A: You know, NAMM is pure gold for this industry. It’s just not so easy for the small companies, especially at the beginning (and especially for people from overseas like us) but we’ll definitely do our best for sure. C: As Andrea said, it’s not easy at all. We just have to work hard right now, doing all that we need to do. If we’ll deserve to stay on this industry, we’ll be part of NAMM of course. That’s my thought. – What are your plans on expanding the business and gaining further reach? A: Of course we’ll do all the necessary to let the people know about AC noises and we’ll continue to do our best to provide high quality effects pedals. We hope to grow up everywhere but especially here in Italy and the rest of Europe, because we’re actually selling more products in United States then here. Don’t get me wrong, we are incredibly happy about that. There are a lot of very cool pedals companies in the U.S. and if the American people is choosing to trust in a brand new company based to the other side of the world like us, it means that we’re doing a good job of course and we’re so much happy about that. We just hope to do the same here, because it will be a real pleasure to have that kind of consideration at our home. – Not counting your own pedal(s).. what is your favorite pedal out there and why? A: Oh man, that’s a million dollar question. I love a lot of stuff out there. Maybe, to be honest, I’m a little bit obsessed with the BitQuest from Dr. Scientist right know. That thing sounds just WOW, probably is the most inspiring pedal on the market right now. C: I can give you an aesthetic judgment because that’s my thing: I love TOMKAT pedals for the clean and classy design, but I also appreciate Dr. No’s work, he’s a real artist.